The Northern Tablelands of New South Wales is a home to a world class collection of national parks. They in turn protect a range of interesting and often rare native plants. Gibraltar Range National Park (GRNP), east of Glen Innes, has its fair share of rare plants. Kunzea bracteolata is one of these rare species that GRNP protects. Although classified as rare this species has a range exceeding 100 kilometres but with scattered populations in both NSW and southern Queensland. GRNP protects a large population. Kunzea bracteolata is a small shrub that reaches a height of one metre in our garden. The spreading branches reach a length of two metres. Leaves are small, elliptical and bright green. Fluffy flowers cover the branches in mid to late spring. In warmer climates flowering would probably occur earlier. Regardless of the flowering period the blooms are both conspicuous and profuse with a strong honey scent. Many insects including the ubiquitous honey bee visit the flowers. Prune lightly after flowering to stop plants becoming straggly. A site in full sun is appreciated. 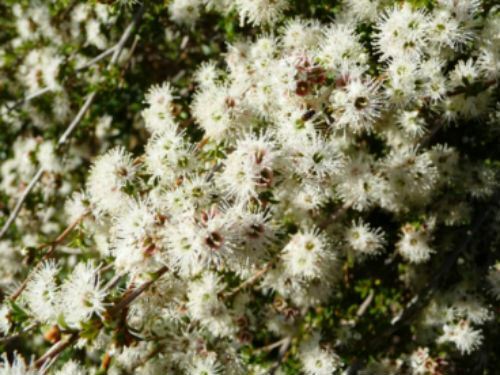 We find that Kunzea bracteolata frost tolerant and once established has low water requirements. As with all the Kunzeas this species propagates easily from cuttings. The type specimen was collected by J. L. Boorman near Wallangarra, on the NSW/Queensland border, in November 1904.